We value friendliness and hospitality… and we see ourselves as more than just a welcoming group, organization, or place. We are a sacred, diverse community of believers gathered around God, Jesus Christ, and the Holy Spirit. If we are members of anything, we are members of the Body of Christ in the world…We are not a club. We are a church without walls…While our home base is a small campus on Second Street in Newport, Vermont where we strive to welcome all who venture through our doors, we also dream of becoming more and more a church without walls. We are called not only to share God’s gifts—including God’s Table—with those who come to us but also to celebrate God’s grace and goodness in ever-widening circles as we reach out in service and share our hope and belief in the "already/not yet" of God's Kingdom…We are not a building. We embrace God in all people…We believe no matter where we go God is already there; already at work in our lives and in our neighbors’ lives (from Second Street to Uganda), and that God completes this work not from above, but from beside through human hands and hearts: Ours. We serve joyfully and humbly in God’s mission in the world…We do not presume to bring God to others. It is bigger than us…Saint Mark’s is a local expression of The Episcopal Church and the Episcopal Diocese of Vermont; we participate in the mission of the Church—namely, to restore all people to unity with God and each other in Christ—as we live and love and learn “in the kingdom, for The Kingdom”…We are not alone. We are changing…Saint Mark’s is not stuck in the past, but rather a living community that in this changed and changing world seeks ever to be renewed through the scripture and traditions of our Christian faith while serving the spiritual needs of those around us in the here and now. We take Scripture seriously, have an abiding love for The Book of Common Prayer—and listen carefully for where else God is still speaking to us today. We seek to cultivate a climate of worship that enables all people to say “Yes!” to the astounding love of God…We are not a relic. We challenge one another with openness…We recognize our ultimate unity in Christ even as we hold different beliefs. We seek not to deny difference, but celebrate unity in diversity as essential to our belief in and strengthening of the complex, sometimes seemingly contradictory Body of Christ (1 Corinthians 12:12-31). We believe unity in diversity is a powerful witness to the hurting world around us…We do not always agree with one another. We are risk-takers…We believe what we pray: that we do not come to God’s Table “for solace only, and not for strength; for pardon only, and not for renewal” (Eucharistic Prayer C, BCP, p.372). We support each other in discerning our own spiritual calling and ministry, value the inherent priesthood of all in our Baptismal Covenant, and confidently strive to fulfill our individual and corporate callings…We are not passive. God is not finished with us yet…We walk together on a life-long pilgrimage of transforming ourselves to become more and more Christ-like. We do this through thought and deed, prayer and laughter, singing and silence—and by sharing stories, bread, faith and all that God has so graciously given us…We are not perfect. ​“We are not alone…” means we are rooted to a specific tradition and that is The Episcopal Church. Our worship and music is rooted in The Book of Common Prayer and the Hymnal 1982 of The Episcopal Church (TEC). But we use them as a scaffold upon which to build worship that feels more contemporary and less formal than some of our past traditions. ​What is the community like? First and foremost, you can expect hospitality that welcomes you to come as you are (however you want to dress and with whatever your beliefs or doubts) and participate at your own level of comfort (sing or not, pray or not, contribute or not, take communion or not…). The worship usually begins with announcements and a welcoming of the children who are then invited to process out to Sunday School in the Parish House next door. Then the worship is a serious of prayers and readings syncopated by the singing of a few hymns, along with a sermon in the middle of it (usually runs ten and fifteen minutes). Two or three readings are from the Bible (Hebrew and Christian New Testament), and one reading may be contemporary poetry or prose. Communion comes at the end, before announcements, the final hymn and a musical postlude. Every is invited to continue the worship next door with a sumptuous coffee hour – lots of food and warm conversation. Except for special days in the year (Christmas, Easter, Thanksgiving perhaps), the worship is about an hour and while not child-centered, the environment is kid-friendly! We welcome children wiggles and giggles and all. As dusk fell on the evening of November 8th, 1879, a small group of men and women met in an "upper room" and so began St. Mark's Episcopal Church. The six men and women who signed the articles of inauguration were Robert J. Wright, M. T. Hamilton, Frederick Charfield, Theophilous Grout, Ellen A. Grant, and Victoria Grant. In reality, the first steps toward establishing St. Mark's had begun in the summer of 1878 with the efforts of six women -- Mrs. Robert Wright, Mrs. A. J. Goodwin, Mrs. Warren Fuller, Mrs. Theophilus Grout, and Miss Victoria Grant. The initial meeting was held in the parlor of the old Memphremagog Hotel. During these early years services were held in the homes of many of the founding families. The Rector of St. Andrew's in St. Johnsbury would come to Newport on occasion to celebrate the Holy Communion. The first rector of St. Mark's was the Reverend B. W. Atwill who served from 1881 to 1883. In the one hundred-plus year history of the church there have been thirty-one rectors with the Reverend A. B. Crichton serving the longest, from 1931 to 1940. The cornerstone of St. Mark's was laid on 5 October, 1882, and the church itself was completed in 1883. The Northeast Kingdom was to see the start of new ministries of the Episcopal Church in the 1870's and 1880's. 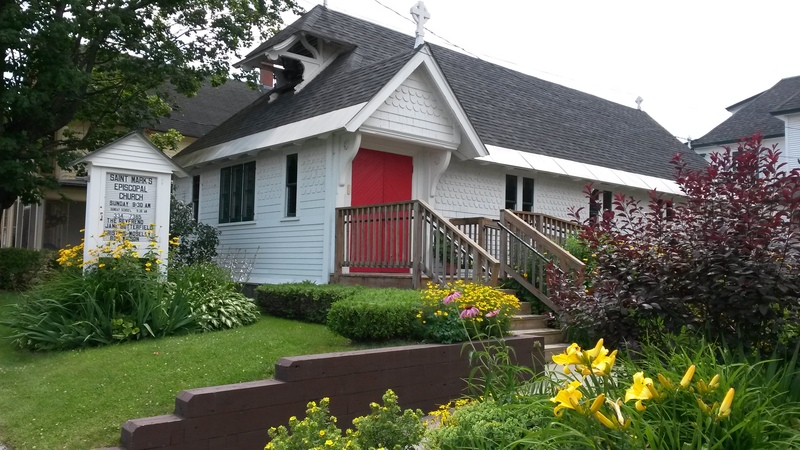 The first service of Christ Church, Island Pond, was in 1874, then St. Mark's. and in the early 1880's St. Augustine's in North Troy was begun. Services were also conducted in Irasburg and Richford. The lives of St. Mark's, St. Augustine, North Troy, and Christ Church, Island Pond, have had a close association. The Rector of St. Mark's was also the Rector of St. Augustine's, and from 1940 to 1960 the Rector of Christ Church as well, making for a busy Sunday. Members of St. Augustine's became an active part of St. Mark's when that parish discontinued services in the late 1960's. In 1899 St. Mark's Rectory was built next to the church. The priests of the parish lived in this rectory on Second Street until 1963 when a new rectory was built on Sias Avenue, and used as the rectory until 1973. In 1930 a pipe organ was installed. This organ later was to be given by the parish to St. Anselm's Chapel at the University of Vermont. During the ministry of the Rev. Paul James, an organ was given to us which is currently in use. There is a fund-raising effort underway to purchase a new organ. Over the decades, St. Mark's has made meaningful contributions to our local and world communities. In the 1960's, St. Mark's was the home of the Northeast Kingdom's first "Head Start" program. The parish also initiated youth programs at the church including reading programs in the local schools and in ecumenical programs and worship. Outreach programs have included the Soup Kitchen during the 1970's, Stephen Ministries (1980-1985), Nursing Home Ministries, 1988 to the present time, supporting the Heifer International Projects and the Sudanese Relocation and Education Programs. One day each month a Souper Lunch is prepared for the community, and the food shelf is open for distribution. The past year has joyfully brought the "re-birth" of the Nursery and Sunday School. Thanks to the faithful efforts of a number of young families with young children, their happy sounds are now a part of our Sunday worship. For over 100 years St Mark's has been a Christian presence in the community of Newport. Often our weakness has been our strength, our simplicity, our glory, and those who have worked and worshiped here have loved and cared. Those who have served and worshiped here have done so with the knowledge that God the Father, God the Son,and God the Holy Spirit is here with us. "...and was completed and consecrated August 9th, 1883, clear from debt, having cost $3,000, and free to all. At his beautiful service, a large number of Clergy from Vermont, New Hampshire and Canada were present, the Right Rev. Bishop Bissell presiding, the sermon being preached by the Right Rev. Bishop Niles, of New Hampshire. January 20, 1883, the Parish was reorganized into a regular corporation, and then transferred all its property on the 13th of March, 1886, to the Trustees of the Diocese of Vermont, to be by them held in trust forever. Robert J. Wright, Fred Chatfield, Thomas Farrant, M.F. Hamilton, Virgil Bogue and Theophilous Grout were the most active in establishing the church, while the last named has acted as Lay Reader since 1880. To him the Church is greatly indebted for his faithful and devoted services in various ways. It is but just to say, that perhaps there is no Parish in the Diocese where the ladies have been such an important factor in establishing the Church as in this; one of whom, the late Mrs. S.W. Fuller, has left a permanent legacy to St. Mark's Church of $5,000. Great credit is due to this little band of Churchmen and women for the noble work they have accomplished." Sunday School - Teachers, 5; Pupils, 40. Newport Express & Standard - Nov. 7, 1924 - Page one. MRS. GROUT died at 560 West 180th St., New York City, Saturday morning, Oct. 26, 1924, from heart failure, after a lingering illness of over three years which confined her to the house. The body was taken to Newport, her old home, and buried from ST. MARK'S Church, Tuesday afternoon, the REV. R.H. TRILL, rector of the church, conducting the service, and making interesting and appropriate remarks on the life and character of the deceased. The interment was in the GROUT family lot, Newport East main Street cemetery, REV. MR. TRILL reading the committal service. MAYOR LINDSAY, City Clerk SPEAR, FRANK R. SHERMAN, E. J. PROUTY, CHARLIE BROWN, HENRY BLANCHARD, old time friends and neighbors, acted as bearers. The choir sang "Lead Kindly Light: and other favorite hymns of the deceased. On the 25th day of November, 1873, MISS BLACK was married to THEOPHILUS GROUT, then a lawyer at Newport, where they made their permanent home until 1901, when they sold their home on School Street with spacious grounds to the Newport School District, on which lot the present Newport high school building now stands. During the thirty or more years that MR. and MRS. GROUT lived in Newport, she was an untiring active zealous worker in organizing and building Saint Mark's Episcopal church at Newport. MRS. GROUT with the other brave and courageous women of the Episcopal faith took the ground that an Episcopal church could be built and paid for and maintained in Newport, and if the fainthearted husbands could not see their way clear to build it, the women would undertake the task. This was too much for the men, and by the unanimous request of all interested THEOPHILUS GROUT drew up the following articles of association, which was the real beginning of the beautiful little SAINT MARK's church and rectory house on Second St.
"Articles of Association of the Mission of SAINT MARK's Church, Newport, Vermont. "We the undersigned citizens of the town of Newport, county of Orleans, state of Vermont, do hereby associate ourselves together as a religious society, under the laws of the state of Vermont, to be known and called as the mission of SAINT MARK's church, Newport. "We associate for the purpose of maintaining the worship of Almighty God, according to the provisions of the Protestant Episcopal church in the United States, in its liturgy, canons and usages, and for doing whatever else may be necessary in promoting the main purpose: "We do hereby adopt, receive and promise entire conformity to the constitution and Canons of the Diocese of Vermont. "Signed at Newport, Vermont, November 8th, A. D. 1879. NAMES "THEOPHILUS GROUT, ELLEN A. GROUT, VICTORIA GROUT, ROBERT J. WRIGHT, M. T. HAMILTON, FREDERICK CHATFIELD, MRS. L. B. CLEVELAND, MRS. M. T. HAMILTON, MRS. W. FULLER, MRS. R. J. WRIGHT, MRS. F. P. DAVIS, MRS. F. CHATFIELD. "Town clerk's office, Newport, Dec. 11th, A.D. 1879. Received for record at ten o'clock a. m., and recorded in Vol. one, page 20, of Newport records in town. Attest: H. S. ROOT, Town Clerk." Immediately after the signing and recording of the foregoing articles of association, the Episcopal ladies formed a guild known as "The Ladies Guild of SAINT MARK's Church, Newport," and the good work commenced. The first year the Ladies' Guild cleared about $800 and within three years had realized around $2000, and a lot was purchased and paid for. On the 5th day of October, 1882, the cornerstone of SAINT MARK's church was laid, with imposing ceremonies by the Right REV. W. H. A. BISSELL, then bishop of Vermont, assisted by BISHOP NILES of New Hampshire, and a large number of visiting clergy and laity from Vermont, Canada and New Hampshire. It was a beautiful and imposing service. Soon after SAINT MARK's church was consecrated it was deeded to the trustees of the Diocese of Vermont, a corporation chartered by the legislation of Vermont, to be by them held in trust forever, to be used only for church purposes, and never to be diverted to any other use or purpose. A few years after SAINT MARK's church was thus consecrated and deeded to the trustees of the Vermont Diocese, it received from MRS. FULLER of Chicago, Illinois, aunt of MRS. M. T. HAMILTON of Newport, a legacy of $5000, which was put into the hands of the trustees of the Diocese of Vermont to be held by them in trust forever, the income thereof only to be used for the support of SAINT MARK's church. At the time this legacy of $5000 was paid over to the trustees as before mentioned, about $1300 interest had accrued, and this was used to help build the present rectory house, no one played a more important part than ELLEN A. GROUT, the subject of this sketch. She loved the little church she had helped to build, thought it beautiful and homelike, and desired to be buried from it, and her requests have been carried out.